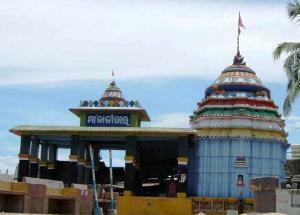 Kalijai temple is situated on an island.It is about 18 km away from Balugaon in south east direction, the residence of the Goddess Kalijai. Kalijai means Kali+Jai, Kali,the Goddess Kali and Jai is a name of a village girl of Banpur,who was drowned there during her visit to Parikuda Gada for her marriage. An accidental storm with deep black cloud was drowned her traditional boat there by the hill and vanished. All the boatmen with her father were alive except that girl Jai undiscovered. Since then many boatmen have listened her low voice during early evening there and she became the adorable Goddess of the locality and became respected among Odiya people.Most of the fisherman community is worshipng Goddess Kalijai as their “Ista Devi”.Ista means who manages all the Ista(Good) and Anistha(Bad) times. Most of the home tourists know that visit to Kalijai is that’s all to visit Chilika. Balugaon is well connected with East Coast Railways and National High way(NH-5). Motor Lunch is availabl at the Jetty near Balugaon,but the scheduled day of visit is only on Sunday.It will take 30 minutes to reach Kalijai from Balugaon.